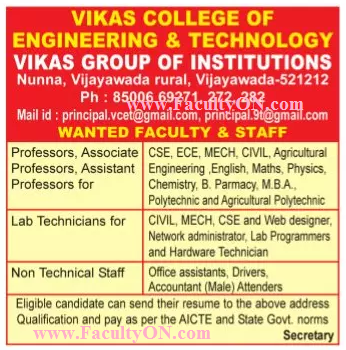 Vikas College of Engineering and Technology, Vijayawada has advertised in the SAKSHI newspaper for recruitment of Professors / Associate Professor / Assistant Professor Plus Non-Faculty jobs vacancies. Interested and eligible job aspirants are requested to apply as soon as possible from 06th April 2018. Check out further more details below. About College: Vikas College of Engineering & Technology is the destination for high quality education comprising almost areas of studies such as Junior, Degree, PG, B.Ed., D.Ed., D.Pharmacy, B. Pharmacy, Polytechnic and MCA . It strives to make quality education affordable through its regular up gradation of standards which match the best in the field. How to Apply: Interested candidates are requested to send updated CV along with copies of certificates and recent passport size photo to the postal address or email address provided below.